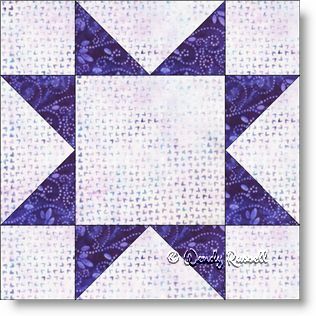 The Sawtooth Star quilt block has been around for a very long time. You will find it featured in hundreds of quilts. The block itself is often featured as the centre of another quilt block, such as the Sawtooth Ladder. This quilt block is designed using only squares and flying geese units. It is a great block for beginners and experienced quilters alike. Although this is a simple quilt block to make, you can do many things with this block in terms of creating a unique quilt. As shown in the sample quilt layouts, by introducing new fabrics and either adding sashing and setting the quilt blocks side by side, or setting the blocks on point, there is no end to the different looks you can create.